Modern medical scanners were used to examine the inside and make a 3D image of the relics of St. John the Baptist. The study was conducted in the Burgas cardio hospital and was filmed by a team of "National Geographic." The shots will be shown in a documentary about the most commented archaeological find of the year, the Bulgarian "24 Chassa" (24 Hours) daily reports Monday. To scan had confirmed conclusions made earlier by other methods - that the bones belong to a man of Mediterranean type, between 30 and 40 years of age, who used vegetarian food, Tsonya Drazheva, Director of the Burgas History Museum and Deputy Head of the excavations on St. Ivan island, told "24 Hours". The study was conducted by Dr. Lachezar Savov, who worked on the scanner in the presence of the relics' discoverer, Professor Kazimir Popkonstantinov. The 3D images that show the internal structure of the find were part of the procedure. The MR studies are basic and can be used by scientists for further analysis, said Drazheva. One could see at first glance that the bones don't have good density, which suggests that the person in question led a difficult life. The Head of the Laboratory of Anthropology Professor, Yordan Yordanov, had also examined the finds. It has been established with certainty that the bones are a right collarbone, a right-hand finger and right hand edge of the upper jaw. Remains, believed to be John the Baptist were uncovered on July 28, 2010, during excavations of the floor of the medieval monastery on Saint Ivan island, near Bulgaria's historical, coastal town of Sozopol. They were placed in a sealed reliquary buried next to a tiny urn inscribed with St. John's name and his birth date. 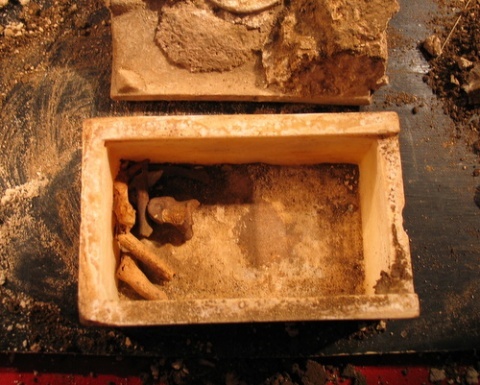 The relics were found by a team of archaeologists, led by Prof. Kazimir Popkonstantinov. The Bulgarian government decided to benefit from the discovery to boost tourism, going as far as to say that Sozopol will help deal with the economic crisis by becoming the new Jerusalem on the Balkans, attracting believers from all over the world. The cabinet allocated additional funds for the renovation of the St. George Church in the town of Sozopol which initially hosted relics. In mid-August, 2010, they were transferred to a silver and gold reliquary - a personal present from Bulgarian Prime Minister Boyko Borisov. The reliquary was handed to the priests in the St. George Church. At the end June, 2011, the relics were moved to the renovated St. St. Cyril and Methodius church in Sozopol. When Bulgarian archaeologists declared they had found relics of John the Baptist, one of the most significant early Christian saints, their discovery drew huge interest, much skepticism within the public and some from the archeological community, and even scam allegations.